The EpiShear™ Cooled Sonication Platform greatly increases sample-to-sample reproducibility when shearing chromatin or DNA by enabling you to precisely position the sonicator probe at the exact same depth in each sample every time. The platform, affectionately known as “Big Jack”, is supplied mounted inside a sound enclosure to reduce noise during sonication. It comes with your choice of a tube cooler that fits 1.5-2.0 ml microfuge, 15 ml or 50 ml tubes; the tube coolers keep your sample cold during sonication, so you don’t have to shuttle it to and from an ice bucket to prevent it from overheating. Figure 1: The EpiShear Cooled Sonication Platform. 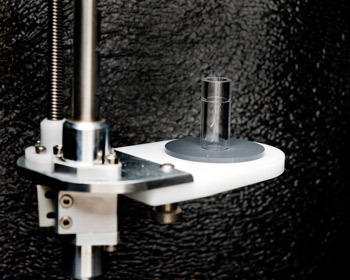 The EpiShear Cooled Sonication Platform positions the probe at the same depth in the sample every sonication, greatly enhancing sample-to-sample reproducibility. The tube coolers, which are available for microfuge, 15 ml and 50 ml tubes, eliminate the need to rest the sample in an ice bath between pulses. The EpiShear Cooled Sonication Platform was designed to improve the sample-to-sample reproducibility obtained when using probe sonicators by enabling the tip of the probe to be positioned at the same depth in the sample each sonication. 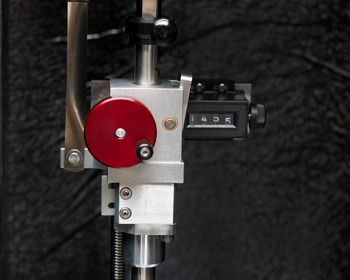 The platform has been machined out of stainless steel and aluminum, and includes a hand crank, a height counter and a vertical alignment tool, so once you have determined the optimal settings for your probe and tube type, you can recreate them over and over. 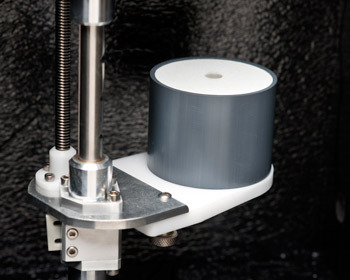 The EpiShear Cooled Sonication Platform is supplied already mounted on a stainless steel rod inside of a sound enclosure. The sound enclosure will reduce the volume of noise produced by your sonicator by approximately 35 db (Figure 1). 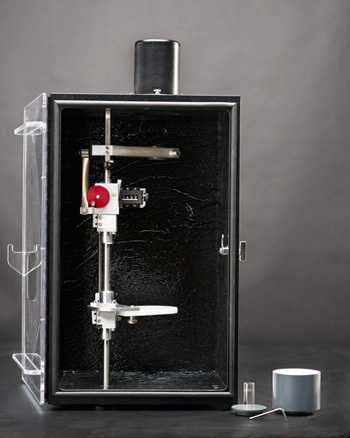 The EpiShear Cooled Sonication Platform is provided inside a sound enclosure with measurements of 28" H (with chimney) x 14.25" W x 12" D (711 mm x 362 mm x 305 mm). The EpiShear Cooled Sonication platform is designed to be used with Active Motif's Tube Coolers, which are available in sizes that fit microfuge, 15 ml and 50 ml tubes. The Tube Coolers keep the sample cold during sonication, so you don't need move the sample to and from an ice bath to keep it cold during sonication. The supplied vertical alignment tool is used to determine the depth of the probe inside the tube when it is in the Cooler. Once the appropriate adjustments have been made to ensure proper probe height within the tube, record the number displayed on the height counter. Using this same setting for all experiments will ensure consistency between samples. With a programmable sonicator like the EpiShear Probe Sonicator (Catalog No. 53051), you can simply set the duration of the On and Off pulses, place the sample in the tube cooler, press Start, then walk away. Figure 2: Close up view of the platform alignment tool, Tube Cooler, 1.5 ml, and the height counter setting. The alignment tool is used to make initial settings to determine the proper height of the probe based on the type of tube being used. After using the alignment tool to position the probe, the settings are confirmed inside the tube within the Tube Cooler. Final adjustments to the platform can be performed to ensure that the probe is centered and that the tip is not touching the bottom of the tube. Finally, the counter height is recorded to ensure that the probe can be placed identically in subsequent sonications simply by setting the platform to the same height counter setting. Active Motif's Tube Coolers are an integral part of the EpiShear Cooled Sonication Platform as they both hold the tube precisely and keep the sample cold during sonication. This enables you to take full advantage of the programmable features of Active Motif's EpiShear Probe Sonicator. No longer will you have to repeatedly take the probe out of the sample and place the sample in an ice bucket to prevent it from overheating. You can simply set the duration of the On and Off pulses, and the sample can remain in the cooler for up to 2 hours of sonication.